Amazon unveiled a host of new Alexa-enabled devices at a US event yesterday. Chris Middleton runs down all the new releases, and explains what they mean for the future. Amazon has deepened its commitment to smart homes and connected lifestyles with a number of new hardware and service announcements, centred on its Alexa digital assistant. The company announced the new lines and Alexa skills at a US event yesterday, confirming Internet of Business’ report of earlier this week. 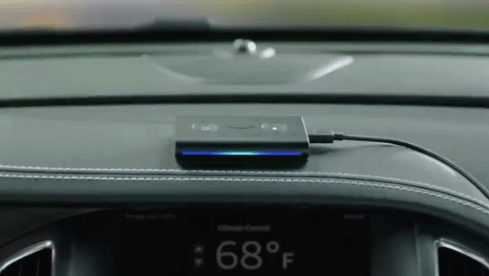 First, the Echo Auto dongle extends Alexa functionality to most cars. The portable device plugs into a vehicle’s infotainment system to provide smart assistant and voice control for traffic reports, shopping lists, playing music, and other skills-based or Amazon-provided functions. 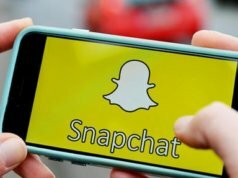 The device can also link to smart home devices on leaving or arriving at the house – to turn lights on or off, for example – and offers a ‘drop-in’ feature to let drivers talk to people on their contact lists. The aim is to bring Alexa at low cost to vehicles that are not part of Amazon’s existing partner programme with BMW, Ford, Lexus, Audi, and Toyota. Amazon also announced an easy-setup smart plug (power point), which allows users to control whatever is plugged into it via Alexa – such as switching on a kettle, for example. The $25 plug needs an Echo device in the vicinity for voice commands, but once set up it can be controlled via the Echo, or remotely via the Alexa app. Meanwhile, Alexa Guard is a new security/home safety device that also integrates with the Echo or Dot. Among other functions, it detects smoke and carbon monoxide and links with existing security products, such as those by ADT and Ring, which Amazon acquired earlier this year for $1 billion. The Ring portfolio itself gains the new Stick Up camera, for indoor and outdoor use. Home security and safety functions are among those thought to be included in Amazon’s long-rumoured Vesta domestic robot, which may turn out to be an amalgam of much of the Alexa-powered range. 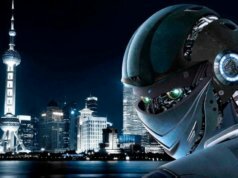 The robot – not mentioned at this week’s event – is believed to be lined up for release in 2019. If it makes it into people’s homes and offices, it could be significant for the humanoid or domestic robot market by finally introducing useful functionality at Amazon’s loss-leading low cost. The benefit for Amazon would be the opportunity to establish a deeper relationship with customers for its services, storefront, and content. A story-telling robot, for example, that also plays music, orders products, secures the home, connects people, switches on lights, and more. Amazon’s FreeTime service for children, which recently gained Alexa integration, was among the offerings refreshed yesterday, with a number of new routines, age-appropriate podcasts, and audiobooks. When the Internet of Things was first talked about, the examples used by Gartner and others to explain the concept were smart fridges and cookers, rather than industrial or smart city applications. Amazon took a step deeper into that world yesterday by announcing a low-cost, Alexa-enabled microwave. The Amazon Basics Microwave isn’t a standalone Alexa device, but communicates with a nearby Echo or Dot speaker for Alexa voice and skill control. Alongside the other announcements, this suggests that Amazon’s vision is for its smart speakers to sit at the centre of the connected home or office and control a web of peripheral devices: an obvious up-selling opportunity for the company. Plus it avoids filling the house with competing, chattering assistants, of course. With deeper retail relationships in the background of every new product, the microwave also includes a Dash button – for ordering popcorn, said Amazon. As ever, the consumer fly is caught in the retailer’s web. 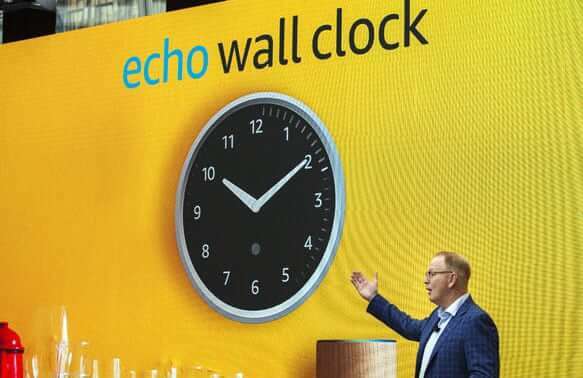 Anyone worried about cooking times on their traditional hob or oven could now use Amazon’s Echo Wall Clock. The low-cost, analog-style device displays Alexa/Echo timers via LEDs, and can be changed automatically to reflect daylight saving time. Again, the clock is not a standalone Alexa device, but links to Echo, Dot and other voice-controlled gadgets. Amazon’s Echo line of standalone devices received an unexpected refresh yesterday with the debut of the Alexa Input: a discreet, ultra-slim version of the Dot, with Bluetooth connectivity and far-field microphones, but minus the built-in speaker. The idea is to turn a user’s existing choice of speaker into an Echo, in effect, allowing them to integrate Alexa with their home hifi or sound bar. Amazon also updated the line with an upgraded Dot, the Echo Plus – a souped-up version of the Echo – and a new version of the Echo Show, with a 10in screen, integration with Microsoft Skype, and improved sound. In August, Amazon announced a partnership with Microsoft to bring the Alexa and Cortana assistants together, so each can now access features of the other’s technology. Music and sound quality are both at the forefront of Amazon’s thinking with the launch of a series of hi-fi separates that also feature Alexa connectivity: the Echo Sub, essentially a smart subwoofer, together with the Link and Link Amp. • According to the latest quarterly research from Strategy Analytics, global smart speaker shipments reached 11.7 million units in Q2 2018. The Google Home Mini was the world’s best-selling smart speaker during the quarter, followed closely by Amazon’s Echo Dot. Apple’s HomePod did not feature in the top-five ranking by shipments, said the report. Meanwhile, new data from Nielsen reveals that US smart speaker adoption increased by 24 percent in Q2. Also announced yesterday was the Fire TV DVR, a voice-controlled ‘recast’ box that beams content to an Echo Show, Spot, Fire TV, or mobile device, and can record multiple shows. Developers were at the forefront of the announcements too. Amazon has introduced a new design language for coders who want to build voice skills that include multimedia elements for the Echo Show, Fire TV, and other screen-enabled devices, including Amazon’s tablets. Using the Alexa Presentation Language – cheekily, APL for short – developers will be able to build voice-based apps that include photos, graphics, and video more easily. Amazon is also introducing the Alexa Smart Screen and TV Device SDK to allow third-party device manufacturers to join the Alexa party. 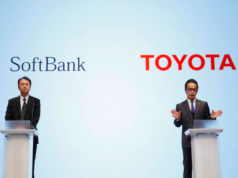 Sony and Lenovo will be among the first adopters. But what does it all mean for Amazon and the future? With the Christmas and holiday season approaching in shoppers’ minds, Amazon’s timing was spot on, with many of the products available before the end of the year. In the longer term, they open up a future in which digital assistants become ubiquitous in the home, car, and office, shifting the prime computing interface to voice more quickly than some might have imagined. However, some users may question why they need a range of peripherals when a lot of the same functionality can be accessed via their smartphones – in the car, for example. But it has certainly been a milestone year for Amazon, which became the world’s second trillion-dollar enterprise just weeks after Apple crashed through the market capitalisation barrier in the summer. 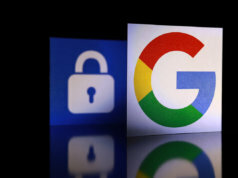 In July, the retail behemoth and connected technology giant reported record Q2 profits of $2.5 billion and 39 percent year-on-year revenue growth. Amazon only topped $1 billion quarterly net income at the end of 2017, so those results represented a major achievement. Earlier this week Internet of Business reported that the company is considering plans to open 3,000 convenience stores, bringing its checkout-free technology to the masses in the one market it was set up to disrupt: bricks and mortar retail. But above all, it has been a significant year for Alexa, which gained new skills and functionality at yesterday’s event – such as the ability to understand a whisper and respond in kind. Earlier this year, Amazon announced that US upgrades of Alexa would allow more natural conversations with its smart devices, without constant use of the ‘Alexa’ trigger word. 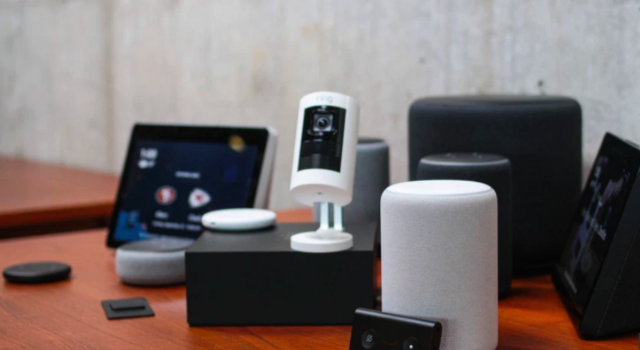 It also debuted its Alexa-powered smart camera, the Echo Look, which connects fashion-conscious consumers with human style-advisors. A boon to some, but a troubling intrusion into consumers’ dressing habits for others. 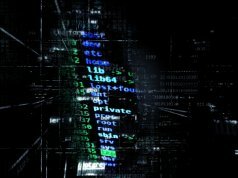 Alexa’s emerging ability to understand everything from a whisper to a shout, often without the ‘Alexa’ prompt, also raises concerns about the assistant’s ability to intrude, or eavesdrop and record private conversations – fears that were heightened this year when an Echo did just that. Other reports have also revealed security failings in Alexa-powered devices. In recent months, Amazon has further diversified into deliveries, content creation, premium subscription services, and more, and is eyeing banking and insurance. In May, for example, Internet of Business reported that Amazon is building a healthcare team within its Alexa division. Amazon is better positioned than most for a future of ubiquitous retail – in which the ability to buy something could be triggered by taking a photo of someone’s outfit, for example. But is the company expanding so far, so fast, and into so many diverse areas that it is losing focus on what it does and who it is for? 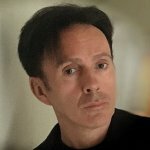 Or will it be the first AI-enabled company to be all things to all people? As Internet of Business also reported, a concern for market watchdogs may be the ease with which each Alexa-powered hardware release deepens the hold that Amazon has over retail and other sectors. Any device that blends dedicated skills with retail and loyalty programmes may effectively shut out competition, forcing companies to engage with Alexa and compete for ‘visibility’ on the platform. For example, any smart cooker or fridge that orders food and drink begs the question of which supplier is being chosen and why, with some commercial relationships behind the scenes perhaps hidden from consumers. Will “Alexa! Order me some coffee!” one day translate as “Alexa! 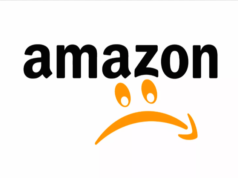 Order Amazon a lawsuit!”? At present, that’s one question to which the digital assistant may not have a meaningful answer.